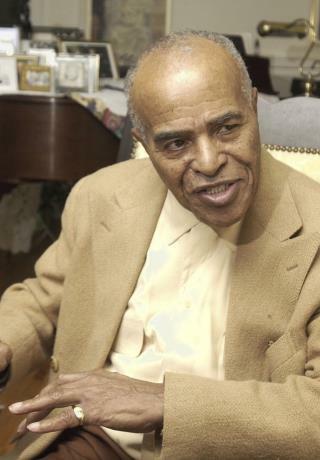 (Newser) – Jon Hendricks, the pioneering jazz singer and lyricist who with the trio Lambert, Hendricks & Ross popularized the "vocalese" singing style in which words were added to instrumental songs, has died. He was 96, AP reports. His daughter, Aria Hendricks, confirmed his death to the New York Times. She said he died Wednesday at a New York City hospital. Hendricks found fame in the 1950s and '60s teaming with Dave Lambert and Annie Ross. Their interracial trio became one of the most celebrated jazz vocal groups ever, and among the latter-day stars they influenced were Joni Mitchell and Manhattan Transfer. Hendricks was born Sept. 16, 1921, in Newark, Ohio, and grew up in Toledo, one of 15 children of a preacher who hoped Hendricks would follow him into the ministry. Lambert, Hendricks & Ross' first album, Sing a Song of Basie, won acclaim for its use of vocalese, in which the voices mimic the instrumental parts. Hendricks wrote the lyrics to existing Count Basie songs, and the three recorded their own voices in layers instead of using backup singers. Others experimented with vocalese before Hendricks, but he's widely regarded as the father of the spirited singing style for popularizing it. In the 1980s, he collaborated with Manhattan Transfer on an album called Vocalese that won three Grammys, one for Hendricks himself.